Patna, Feb 6 (IANS) The Rashtriya Janata Dal (RJD) will contest 20 to 22 of the 40 Lok Sabha seats in Bihar and leave the rest to its allies, a party leader said on Wednesday. RJD state President Ramchandra Purbe said RJD was a mass-based party and its seat sharing formula will be finalised soon. 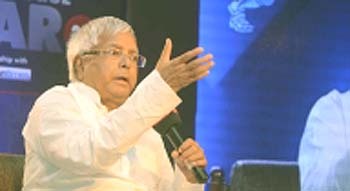 "Leaders of the Grand Alliance have met and discussed seat sharing with (RJD chief) Lalu Prasad. The seat sharing will be finalised, with consensus. There is no problem in it," Purbe told the media. RJD's allies include the Congress, Hindustani Awam Morcha and RLSP among others. In the 2014 Lok Sabha polls, RJD won only four seats and the Congress two. The NCP won one seat. The JD-U, which contested separately, also won only two seats. The BJP-led NDA won 31 seats, with the BJP's tally being 22.